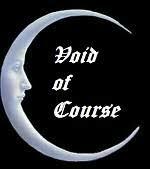 If you’ve been interested in astrology for very long, you will have no doubt heard about the Void-of-Course Moon. Even the name is strange, for a long time I wondered what the ‘of course’ part of it meant. The Moon travels in it’s ‘course’ around the earth in predictable ways. The Moon transits through a zodiac sign every two days and six hours. When the Moon is in a sign, it will make ‘aspects,’ or be in various angles, from the other planets. At some point after it has made all the aspects possible, it will make no more aspects until it enters the next sign. When it’s in this state, of making no more aspects while still in a sign, that it is ‘void-of-course.’ It may be easier to think of it as void-ON-it’s-course through the sign. You’ve probably heard that you shouldn’t start things while the Moon is void-of-course. Well, that’s not actually true UNLESS you have asked a Horary question about the thing you want to start. EVERYTHING is about context in astrology, all forms of astrology, and especially Horary astrology. If the Horary chart shows that the Moon is void-of-course, then it usually means that ‘nothing will come of it.” Whatever ‘IT’ is. USUALLY is the key word here. Often, however, they may be stronger aspects happening between the relevant planets that say YES, it will happen, yes, it’s a good thing to do now and that you can ignore the void-of-course Moon. 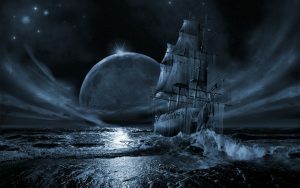 For everyday life, however, the Moon being void-of-course is not anything to take into consideration. Really. You wouldn’t be able to get anything done if it did matter, and you wouldn’t be able to make a single move in your life – every couple of days – without consulting the stars. That is no way to live! Coming from a professional astrologer, that is saying something. And, if you are concerned enough about a course of action turning out to be a successful thing, then get either a Horary question reading or a Muhurta. The Horary chart will tell whether or not it is something worth doing, if it will happen, if it will be successful, if it will be good for you or others in your life, when to do it, and more (Horary astrology doesn’t use the birth chart – it is created by asking a question). The Muhurta is the Vedic technique (aka the Electional chart in western astrology) for choosing the best possible time to do something based on your birth chart (accurate birth information is very important for a Muhurta). Same thing for Natal astrology. If you were born during a void-of-course Moon, it doesn’t mean that nothing of any value will happen in your life! We simply look at the last aspects the Moon made and many other things about the Moon to get an idea of what your life is about from the perspective of the Moon. The Moon is about perspective, if you remember from my previous articles on the Moon (the Moon looks ‘all around’), and it’s time to get some perspective on the void-of-course Moon. If you read in your favorite daily or monthly horoscope not to do something because the Moon is void-of-course, IGNORE it. I swear, nothing will come it! When you want to do something important like get married, open a business, take a long-distance trip, starting writing a book, start chanting mantras, etc., then get a Muhurta Electional Report. I will need your birth data to do a Muhurta (day, month, year, place and TIME of birth). This is a report generated by the incomparable Kala Astrology Software.